This stock market in the past month didn’t offer investors much of joy as major indexes gave back a big chunk of their gains after peaked later July. At the same time, gold has made a quite come back to close at a six-month high of $694 an ounce yesterday. It could go over $700 today thanks to the weak employment data. Actually, gold has been quite lately. Since breaking through the $700/ounce mark in early 2006, the bullion has been traded in a tight range between $650 and $700 since the beginning of the year. The rally of the metal in the past couple of days seems having something to do with European Central Bank’s decision to hold interest rate steady two days ago while a rate cut by the Federal Reserve two weeks from now is very likely. Now that gold is getting close to the $700 per ounce mark, does it make gold a good investment for the long term? Gold generated average annual price appreciation of 4.7% a year on average. That pales next to the 11.8% average return of stocks, measured by the Standard & Poor’s 500. The problem for such a conclusion, of course, is that nobody is probably going to hold gold for 70 years just to get some 4% return. To me, 20 years seems to be a reasonable investment period. Though when talking about investing in gold, there many gold expert suggest that the only way is told the bullion. However, when buying physical gold, there are plenty of extra fees, such as dealer markups, shipping and handling, and insurance. To profit, gold price sometimes has to go up a lot depending on the fees paid at purchase as when a deal buys back a piece of gold, the price paid is the price of spot gold (check out my posts in buying gold). For example, I bought a Buffalo coin back in March for $669 from Bullion Direct. After shipping and handling (insurance was included), the final cost is $685. 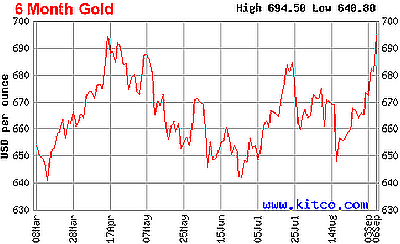 Since then spot gold price has gone up from $647 to today’s $705. If I sell it today, I can only make $20 profit instead of $60. Not a good investment. My own study has shown that adding even a small portion of precious metal in the portfolio can reduce the risk and improve returns. I am not bothered by the mediocre 4% return as suggested by the article. Gold: Is $1000 an Ounce in the Offering? very good website. Lots of good info and personal stories. I have added a link from my website. In my view, diversification isn’t only about big returns, it is also about security. A fallacy in the world of finance is assuming that previous returns can be used to predict future returns. They can’t be. Great that the S&P has gone up up up over the past 80 years. That doesn’t mean that it will keep going up for the next 80 years. There is no way to know. I agree with you that diversification isn’t just about return. It’s about maximizing return and minimizing risk as the same time. And what happened in the past doesn’t mean it will happen again in the future. only get much, much higher. Predicting short-term result is difficult, but for the long-term, it’s relatively easier. As for gold, I still feel it’s a good diversifier because of it’s weak correlation with the broad market (however, if investing through mutual funds, the correlation is not that weak anymore. In that sense, gold ETFs may be a better choice) and the demand for gold is still there especially in the developing countries. Unfortunately, gold can never be really consumed. As production continues, there will be more and more gold on the market. But gold still has its appeals to many people and they will hold it for a long, long time. And that could create opportunities to have gold in the portfolio.